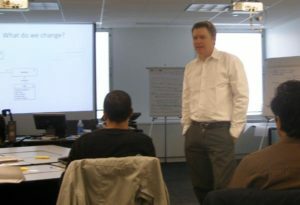 ONE DAY COURSE for any project leaders, product managers, business analysts and domain experts. Build your awareness of the basic concepts and value of Domain-Driven Design (DDD) from a business perspective in one day. Understand wha t DDD is and when and why it is valuable to software intensive organizations. Overview the basic principles and processes needed develop the useful models, tie them into implementation and business analysis, and place them within a viable, realistic strategy. Explore the role of business people in a DDD project, and how they work closely with the development team. Context Mapping: A pragmatic approach to dealing with the diversity of models and processes on real large projects with multi-team/multi-subsystem development. Of course we also have the DDD Immersion for the hands-on members of your software development teams, and Strategic Design for architects, management and other strategic leaders.